Assassin’s Creed comes out in just one week but naturally, while at EGX, I took the opportunity to try out the first public showing of the new conquest battles. Building on from Rosh’s preview of Assassin’s Creed Odyssey from Gamescom, I was able to spend a good amount of time with the game and also given the exclusive chance at EGX to try out both characters in battle. What really impressed me with Assassin’s Creed Odyssey is the aesthetic quality. Outside of the battle I got to explore a little encampment, wander around and see the characters that will inhabit this version of Greece, as well as some of the scenery that you’ll be able to explore. While I only got to see a very limited amount of the area, what I did see looked absolutely fantastic. Another good surprise, following recent releases, is the lack of any obvious bugs. 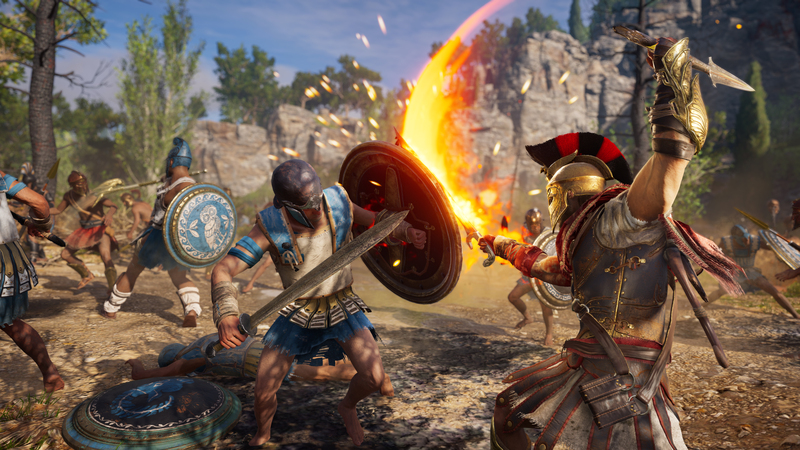 Conquest is the way in which the setting of Assassin’s Creed Odyssey truly comes to life. 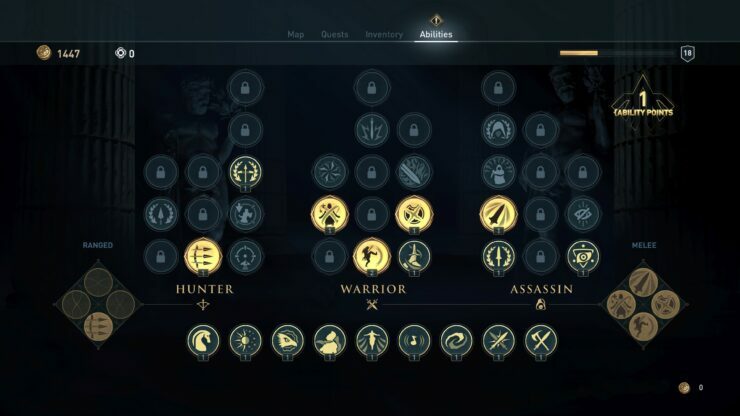 Set, and also simulating the Peloponnesian War, the world of Odyssey is divided into a number of regions that come under the influence of either Athens or Sparta. Each of these states will have their own force, leader and influence. The fate of these states, what happens to them, will eventually be down to you and your actions. How you change the game and how it changes around you, plus the variety found within Greece and the Aegean islands should offer for a more intriguing world to explore. Particularly as you travel the sea between these islands, with a good chance of combat while sailing as you encounter mercenaries and more. Another interesting feature is the fact that Odyssey will include more fantastical elements, including enemies like Medusa. Other titles always held these fictional elements for DLC or as a side event, whereas this looks to feature them as part of the core story. 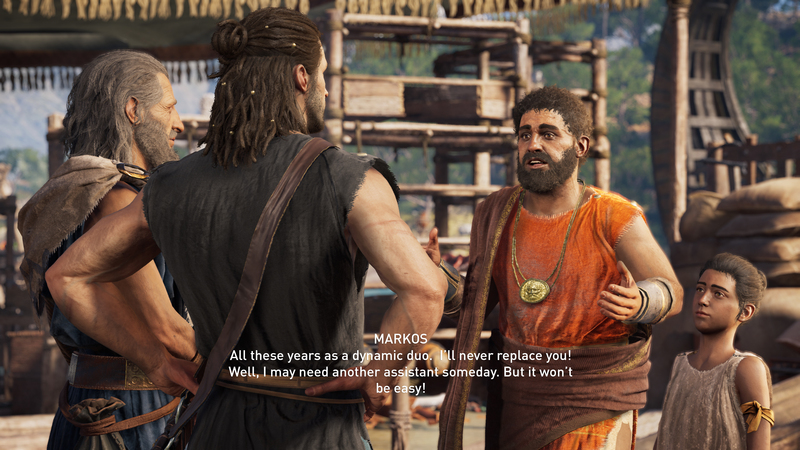 One major thing to note with Odyssey is the ability to play as either a male (Alexios) or female (Kassandra) character. As said, I had the luxury of being shown how to swap between characters and try them both out. From my experience, there isn’t a huge difference between the two. Both were very responsive, more than able to hold their own in battle and the combat system was both fluid and engaging, feeling like it had some weight behind it. My recent lack of recent history will the series will show here (this I’ll explain later). The last I remember of the series was when you effectively held block, an enemy took their shot and you just flailed back at them, hitting the magical insta-kill. It was never the most involving of systems, too easy to game and felt somewhat disembodied from the physicality of the assassinations. Granted, as time has moved on Assassin’s Creed has been less about the assassinations and more about exploring and moving through yet another period of history. Naturally, one of your special attacks has to be the front kick where you’ll instinctively find yourself acting out the role of Gerard Butler in 300. What was it, ‘This. Is. Athens!’? Or at least that may be the case if you’re taking the side of Athens in any particular fight. I genuinely can’t remember which side I was fighting for, but I certainly found myself enthralled in the challenge of the conquest battle I took place in. It’s this challenge that impressed me more than anything else. I actually lost twice. Not only do you have to actively engage in the battle to progress through, but you’ll also quickly find that if you don’t fight at least a little tactically, you’ll get overwhelmed. Both sides in a battle have their own status bar, showing the current quantity/health of the army on the field. A number of regular units, with select captains, make up the units. Once you wear down the regular troops you’ll find the enemies hero appears, making quick work of any regular unit, this is when you need to get involved. For a series that I’ve been disappointed with following Assassin’s Creed Brotherhood (with the exception of Black Flag and Origins), I’ve found Assassin’s Creed Odyssey to be a very pleasant surprise. It looks to be building on this from what I’ve both seen and played, letting the series hit a new peak. A further benefit is the fact that Ubisoft has revealed they will be taking yet another break following this release. This will give them even more time to further improve on the two games (Origins and Odyssey) that broke the stagnation that has plagued the series. Assassin’s Creed Odyssey will launch next week, on October the 5th, for the PC, PlayStation 4, Xbox One and Nintendo Switch. Much like Division 2 (you can read my preview here), I’ve found myself pleasantly surprised and I’m now looking forward to the game.